Author contributions: Shen GS and Zhao JD contributed equally to this work; Shen GS, Zhao JD and Xu BH designed the research; Zhao JH, Ma XF, Du F, Kan J, Ji FX, Zheng FC and Wang ZY performed the research; Kan J and Ji FX contributed new reagents/analytic tools; Shen GS and Zhao JD analyzed the data and wrote the paper. Supported by National Natural Science Foundation of China, No. 81360318; and the Application and Basic Research Program of Qinghai Province of China, No. 2014-Z-745. Institutional review board statement: The study was reviewed and approved by the Qinghai University Affiliated Hospital and National Cancer Center/Cancer Hospital, Chinese Academy of Medical Sciences and Peking Union Medical Colleg Institutional Review Board. Informed consent statement: Informed consent was obtained from all individual participants for whom identifying is included in this article prior to study enrollment. Data sharing statement: Technical appendix, statistical code, and dataset available from the coauthor at guoshuangshen@126.com. Participants gave informed consent for data sharing. AIM: To determine whether the positive status of human epidermal growth receptor 2 (HER2) can be regarded as an effective prognostic factor for patients with gastric cancer (GC) undergoing R0 resection. METHODS: A total of 1562 GC patients treated by R0 resection were recruited. HER2 status was evaluated in surgically resected samples of all the patients using immunohistochemical (IHC) staining. Correlations between HER2 status and clinicopathological characteristics were retrospective analyzed. Hazard ratios (HRs) and 95% confidence intervals (CIs) were estimated using Cox proportional hazard model, stratified by age, gender, tumor location and tumor-node-metastasis (TNM) stage, with additional adjustment for potential prognostic factors. RESULTS: Among 1562 patients, 548 (positive rate = 35.08%, 95%CI: 32.72%-37.45%) were HER2 positive. Positive status of HER2 was significantly correlated with gender (P = 0.004), minority (P < 0.001), tumor location (P = 0.001), pathological grade (P < 0.001), TNM stage (P < 0.001) and adjuvant radiotherapy (74.67% vs 23.53%, P = 0.011). No significant associations were observed between HER2 status and disease free survival (HR = 0.19, 95%CI: 0.96-1.46, P = 0.105) or overall survival (HR = 1.19, 95%CI: 0.96-1.48, P = 0.118) using multivariate analysis, although stratified analyses showed marginally statistically significant associations both in disease free survival and overall survival, especially among patients aged < 60 years or with early TNM stages (I and II). Categorical age, TNM stage, neural invasion, and adjuvant chemotherapy were, as expected, independent prognostic factors for both disease free survival and overall survival. CONCLUSION: The positive status of HER2 based on IHC staining was not related to the survival in patients with GC among the Chinese population. Core tip: The study retrospectively analyzed the associations between the positive status of human epidermal growth receptor (HER) 2 and survival of patients with gastric cancer (GC) undergoing R0 resection among the Chinese population, and found that the positive status of HER2 based on immunohistochemical staining was not related to survival in GC patients. The human epidermal growth receptor 2 (HER2) is now well recognized as a key factor in the development of certain solid human tumors, most notably in breast cancer. It activates numerous downstream pathways in response to extracellular ligands, regulating diverse processes that include differentiation, migration, proliferation and survival[3,4]. Over the last few years, HER2 has been the most frequently studied molecular biological prognostic factors in various tumors[5-7]. In gastric cancer (GC), the ToGA trial was the first study showing the clinical benefit of trastuzumab in combination with chemotherapy for HER2 positive advanced GC patients[8,9]. That is to say, HER2 status is thought to be an important prognostic factor and biologic agent[10-12]. However, a post-hoc subgroup analyses failed to show survival benefits of trastuzumab therapy in Asian populations. Although several studies have evaluated the poor prognosis of GC with HER2 overexpression recently[13,14], the clinical significance of such association remains controversial[14-16]. Therefore, we conducted this retrospective study to examine whether the positive status of HER2 can be regarded as an effective prognostic factor for patients with GC undergoing R0 resection among the Chinese population. All procedures performed in the study involving human participants were in accordance with the ethical standards of the institutional and/or national research committee and with the 1964 Helsinki declaration and its later amendments or comparable ethical standards. This study was also approved by institutional review board of Qinghai University Affiliated Hospital and National Cancer Center/Cancer Hospital, Chinese Academy of Medical Sciences and Peking Union Medical College. Additional informed consent was obtained from all individual participants for whom identifying is included in this article. In this retrospective study, 1562 patients with GC who underwent R0 resection between December 2009 and December 2011 at Qinghai University Affiliated Hospital, Xining, or National Cancer Center/Cancer Hospital, Chinese Academy of Medical Sciences and Peking Union Medical College, Beijing, or People’s Hospital of Qinghai province, Xining, were recruited. Patients were treated exclusively by total or subtotal gastrectomy with lymphadenectomy according to tumor location; neoadjuvant chemotherapy or radiotherapy was not administered to any patients. Patients’ characteristics regarding age (categorical age: <60 years vs≥ 60 years), gender, minority, family history, tumor location, histological grade, tumor stage, tumor embolus, neural invasion and adjuvant chemotherapy and radiotherapy are listed in Table 1. Each cases was staged according to the tumor-node-metastasis (TNM) cancer staging system of malignant tumors 7th edition advocated by the American Joint Committee on Cancer (AJCC). Table 1 Baseline and clinicopathological characteristics among gastric cancer patients with different human epidermal growth receptor 2 status n (%). 1The parametric P value is calculated by t-test for numerical covariates and χ2 test for categorical covariates. Number of observations in the original data set = 1562. Number of observations used = 1313, owing to the missing value occurring in family history of cancer (249). HER2: Human epidermal growth receptor 2. All patients were evaluated for disease recurrence and survival status by clinical examinations, upper gastrointestinal endoscopic assessment, and diagnostic imaging (chest radiograph, ultrasonography, computed tomography, or magnetic resonance imaging) every 3 mo during the 1st year and once 6 mo thereafter until death or the last time of follow-up. Samples were removed from tumors; grossly necrotic tissue was avoided. Immediately after surgical resection, samples were processed for pathological examination while the remainder was washed with a cold saline solution, divided into aliquots, rapidly transported on ice to the laboratory, and stored at -70 °C pending biochemical studies. Specimens from neoplastic tissues were processed at the same time. They were fixed in buffered 10% formalin, embedded in paraffin, and 4-μm thick sections were cut from the paraffin block of each specimen and applied to slides for immunohistochemical (IHC) staining. The IHC analysis with the Herecp test was performed according to the manufacturer’s instructions. In brief, heat-induced epitope retrieval was performed on the deparaffinized sections in advance by immersing the slides in Epitope Retrieval Solution (10 mm citrate buffer; pH = 6.0), which had been preheated to 95 °C. They were then placed in a water bath at 95 °C for 40 min, followed by incubation for 20 min at room temperature, then endogenous peroxidase was quenched with Peroxidase Blocking Reagent. Next, the slides were incubated at room temperature for 30 min with a ready-to-use rabbit polyclonal antibody to HER, and the primary antibody was detected by incubation at room temperature for 30 min with Visualization Reagent (dextran polymer conjugated with horseradish peroxidase and goat anti-rabbit immunoglobulin). After washing, slides were developed with Substrate Chromogenic Solution at room temperature for 10 min. The results were scored following the HER2 scoring scheme (scores 0, 1+, 2+ and 3+) in accordance with DFA-approved system for breast cancer and interpreted by two independent pathologists who were blinded to the clinical information, and the inconsistent results were also judged by the third pathologist. Positivity status of HER2 was defined as IHC 3+, and the others were considered as negative. Pearson χ2 tests or Fisher exact tests were used to explore the correlation between HER2 status and clinicopathological characteristics. Kaplan-Meier method was performed to calculate the disease free survival (DFS) rate and overall survival (OS) rate, and survival curves were compared using log-rank test. Hazard ratios (HRs) and 95% confidence intervals (CIs) were estimated using Cox proportional hazard regression model with and without additional adjustment for potential prognostic factors. The proportional hazard assumption was examined using models that allowed time-dependent HRs combined with curve of log[-log (t)]. All P-values were two-sided and P-values less than 0.05 were considered statistically significant. All analyses were conducted using SAS version 9.1.3 service pack 4 (SAS Institute, Inc., Cary, NC). A total of 1562 patients with a median age of 59 years (range: 20-84 years) were recruited and screened for HER2 status by IHC staining, of whom 548 were considered HER2 positive. Baseline and clinical pathological characteristics are outlined in Table 1. Of these 1562 patients, 1176 (75.29%) were male, 1505 (96.35%) were Chinese Han, 157 (11.96%) were reported with a positive history of familial cancer, and 1006 (64.40%) with primary tumor located in gastric were verified by pathology. All the patients were treated by R0 resection, with 389 (24.90%) patients developing tumor embolus. Therefore, all patients in this study had enough tumor samples to conduct the IHC analysis. Poorly differentiated tumors were observed in 71.32% of patients, and 54.99% of patients had pTNM stage III disease. Besides, 886 (56.72%) and 102 (6.53%) patients accepted the adjuvant chemotherapy and radiotherapy, respectively, after the surgical treatment owing to the neural invasion (229, 14.66%) or other reasons. Table 1 shows the HER2 status and clinicopathological characteristics between HER2 positive and negative patients. Of all the patients, 548 tested positive for HER2, with a positive rate of 35.08% (95%CI: 32.72-37.45%). No significant differences were observed for categorical age (<60 years vs≥ 60 years), familial cancer, tumor embolus, neural invasion or adjuvant chemotherapy. We found that the following factors were statistically associated with the HER2 status. Compared with negative status of HER2, patients with positive status had a significantly lower proportion of male gender (62.93% vs 37.07%, P = 0.004), Chinese Han population (65.71% vs 34.29%, P < 0.001), GC (62.03% vs 37.97%, P = 0.001), pTNM stages (I: 55.20% vs 44.80%, II: 65.55% vs 34.45% and III: 68.92% vs 31.08%, respectively, P < 0.001) and adjuvant radiotherapy (74.67% vs 23.53%, P = 0.011). In contrast, compared with patients with positive status of HER2, patients with negative status had a lower proportion of high differentiation (40.79% vs 59.21%), whereas a higher proportion of moderate differentiation (38.11% vs 61.89%) and low differentiation or signet-ring cell cancer (31.63% vs 68.37%) with P-values less than 0.001. Because of the potential differences in DFS among the patients with negative or positive status of HER2, we estimated the HRs and adjusted HRs. There were no statistically significant associations between the status of HER2 and DFS in GC, regardless of additional adjustment of potential prognostic factors (Table 2). Table 2 Hazard ratios and 95% confidence intervals for the association between potential prognosis factors and gastric cancer. 2Multivariable HRs and 95%CI with P value based on Cox proportional hazard regression model. Number of observations in the original data set = 1562. Number of observations used = 1313, owing to the missing value occurring in family history of cancer (249). DFS: Disease free survival; OS: Overall survival. In stratified analyses, we observed that the risk of disease progression was marginally significantly increased for GC patients in both younger population and older population (≥ 60 years), although the HR reached statistical significance only in the older group (HR = 1.32, 95%CI: 1.02-1.71, P = 0.032). Results were also marginally significant for risk of disease progression in pTNM stage, especially in stage I (HR = 1.86, 95%CI: 0.99-3.50, P = 0.056) and stage II (HR = 1.55, 95%CI: 0.94-2.55, P = 0.089) according to the AJCC-TNM Cancer Staging 7th edition (Tables 2 and 3, and Figure 1). 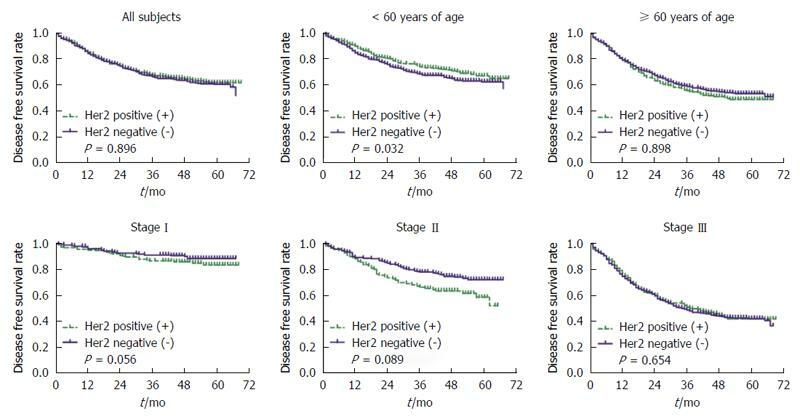 Figure 1 Kaplan-Meier survival curves for disease free survival rate stratified by categorical age (< 60 year vs≥ 60 year) and pTNM stage without adjustment, respectively. The green dash with plus indicates the positive status of HER2, and the blue solid with plus indicates the negative status of HER2. HER2: Human epidermal growth receptor 2. 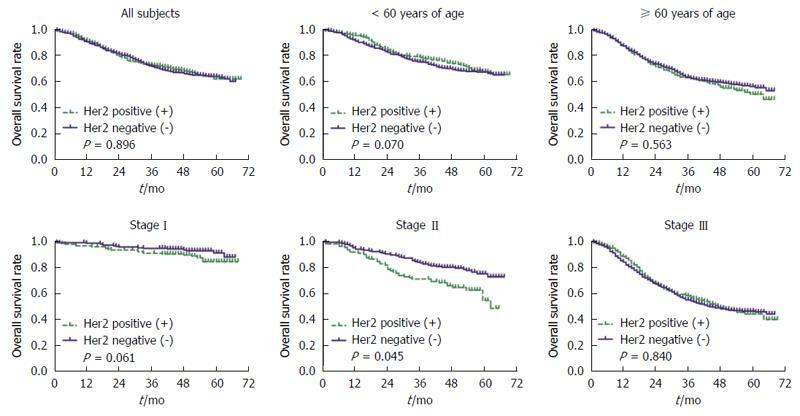 Figure 2 Kaplan-Meier survival curves for overall survival rate stratified by categorical age (< 60 year vs≥ 60 year) and pTNM stage without adjustment, respectively. The green dash with plus indicates the positive status of HER2, and the blue solid with plus indicates the negative status of HER2. HER2: Human epidermal growth receptor 2. Table 3 Adjusted1 hazards ratios for the association between human epidermal growth receptor 2 status and gastric cancer stratified by age, gender, tumor location and TNM stage. 1Adjusted HRs and 95%CIs are calculated using models stratified by age, gender, location and TNM stage, with additional adjustment for ethnic, history of family cancer, tumor embolus, neural invasion, adjuvant chemotherapy and adjuvant radiotherapy. Number of observations in the original data set = 1562. Number of observations used = 1313, owing to the missing value occurring in family history of cancer (249). DFS: Disease free survival; OS: Overall survival; TNM: Tumor-node-metastasis. No significant association was observed between HER2 status and OS rate. Further stratified analyses showed marginally statistically significant associations in both the older patients (HR = 1.28, 95%CI: 0.98-1.68, P = 0.070) and patients with early pTNM stage (II vs I: HR = 2.03, 95%CI: 0.97-4.23, P = 0.061; III vs I: HR = 1.75, 95%CI: 1.04-2.94, P = 0.035) (Tables 2 and 3, and Figure 2). As expected, the estimated parameters of categorical age (HR = 1.42, 95%CI: 1.18-1.71, P < 0.001), pTNM stage (II vs I: HR = 2.61, 95%CI: 1.76-3.87, P < 0.001; III vs I: HR = 6.50, 95%CI: 4.57-9.23, P < 0.001), neural invasion (HR = 1.51, 95%CI: 1.21-1.89, P < 0.001), and adjuvant chemotherapy (HR = 0.79, 95%CI: 0.65-0.95, P = 0.015) statistically significantly affected DFS in both univariate and multivariate analyses, that is to say, these factors were independent prognostic factors for DFS among GC patients. Furthermore, categorical age (HR = 1.39, 95%CI: 1.15-1.70, P < 0.001), pTNM stage (II vs I: HR = 3.33, 95%CI: 2.14-5.18, P < 0.001; III vs I: HR = 8.70, 95%CI: 5.83-12.98, P < 0.001), neural invasion (HR = 1.68, 95%CI: 1.33-2.12, P < 0.001), and adjuvant chemotherapy (HR = 0.73, 95%CI: 0.60-0.90, P = 0.002) were also independent prognostic factors for OS (Table 2). GC is the fourth most frequently diagnosed cancer and the second leading cause of cancer-related mortality worldwide. However, China accounts for approximately 45% of world’s GC cases with an estimated 420489 new cases and 330010 deaths in 2012, and GC remains the second most common GC in both urban and rural areas in China. To date, treatment outcomes for GC remain poor, particularly in patients with inoperable or metastatic disease. Therefore, there is a clear need for effective therapeutic regimes for GC patients. HER2 cancer biomarker testing in GC has been a highly controversial subject, with huge clinical advances taking place in this field while major biomarker mythology discrepancies have persisted[8,22]. HER2 positive GC patients tended to have a more aggressive disease[12,23,24]. Previous studies reported that the prevalence of HER2 amplification is rare and highly heterogeneous in GC with an estimated rate ranging from 4% to 53% owing to the different techniques, methodologies, and scoring systems applied in the studies[4,25-27]. To avoid potential pitfalls in our results, we applied the scoring system approved by the Food and Drug Administration for breast cancer and found that the positive rate of HER2 was approximately 35.08% (95%CI: 32.72-37.45%), which is consistent to the previously reported rates. Although recent studies have been conducted to validate the HER2 scoring system for GC in both IHC analysis and fluorescence in situ hybridization (FISH) analysis, the concordance between FISH and IHC ranged from 88.5% to 93.5%[2,28-30]. In addition, previous reports have demonstrated that a higher rate of HER2 expression is more frequently in intestinal-type than in diffuse-type according to Lauren’s classification[8,31] and more common in gastroesophageal junction cancer than in GC, but this is not the case in our study. The role of HER2 as a prognostic factor in GC has been controversial and some initial studies failed to find an association with prognosis[15,26], as in our results. In the post-hoc subgroup analysis of ToGA (Trastuzumab for GC) trial, HER2 positive patients from the Asian population did not reveal a statistically significant improvement of DFS or OS. However, several studies have reported a direct correlation between HER2 expression or HER2 amplification and poorer survival, especially in patients with surgical treatment, gastroesophageal junction cancer and intestinal-type cancer[22,23,33-35]. Even in the Chinese population, Liang et al and Zhang et al have demonstrated a strong association between HER2 expression and unfavorable survival. In our study, we retrospectively analyzed 1562 patients with GC, all of whom were treated by R0 resection and 35.60% of whom had cardia GC, and found that positive status of HER2 did not affect DFS or OS among the Chinese population. Furthermore, we also conducted subgroup analyses stratified by categorical age, gender, tumor location and pTNM stage. Marginally statistically significant associations were observed between HER2 overexpression and GC in younger patients (PDFS Interaction < 0.001, POS Interaction = 0.003, respectively) and patients with early pTNM stage (PDFS Interaction = 0.037, POS Interaction = 0.041, respectively). Owing to the post-hoc defined group the difference was found by exploratory but not by preplanned analysis, and unrestricted subgroup analysis generates multiple comparisons that dramatically increase the likelihood of detecting a probability value of nominal statistical significance (P < 0.05) by chance alone. Therefore, further study should be conducted to confirm these associations in the future. On the other hand, several limitations should be notable. First and foremost, status of HER2 was tested using IHC analysis only, which may be prone to false negative results especially for IHC 2+ cases, and then lead to bias eventually. Second, sampling errors in specimens of biopsy size may be caused by heterogeneous overexpression of HER2 in GC, which should also be taken into consideration. Third, Lauren classification was also reported to be an important pathological feature of GC patients combined with HER2 status, which indicated a better prognostic factor, while we failed to test the Lauren classification. Finally, 886 (56.72%) and 102 (6.53%) patients received subsequent adjuvant chemotherapy and radiotherapy, respectively, which may lead to a protective effect for patients with GC, despite additional adjustments in this study (Table 2). In summary, our study provides evidence that HER2 expression was correlated with clinicopathological features of patients with GC undergoing R0 resection, but not associated with unfavorable DFS and OS among the Chinese population. Recently, several studies have evaluated the poor prognosis of gastric cancer (GC) with human epidermal growth receptor 2 (HER2) overexpression, whereas the clinical significance of such association remains controversial, especially in the Chinese population. Therefore, we conducted this retrospective study to examine whether the positive status of HER2 can be regarded as an effective prognostic factor for patients with GC undergoing R0 resection among the Chinese population. Over the last few years, HER2 has been the most frequently studied molecular biological prognostic factor in various tumors. In GC, the ToGA trial was the first study showing the clinical benefit of trastuzumab in combination with chemotherapy for HER2 positive advanced GC patients. However, a post-hoc subgroup analysis failed to show survival benefits of trastuzumab therapy in Asian populations. Besides, several studies have evaluated the poor prognosis of GC with HER2 overexpression recently, but the clinical significance of such association remains controversial. The authors conducted this retrospective study to examine whether the positive status of HER2 can be regarded as an effective prognostic factor for patients with GC undergoing R0 resection among the Chinese population, and found the positive status of HER2 based on IHC staining was not related to the survival in patients with GC among the Chinese population. In this study, we failed to show survival benefits of trastuzumab therapy in Chinese populations. Therefore, it should be more prudent to use trastuzumab in combination with chemotherapy for HER2 positive GC patients undergoing R0 resection. The manuscript is very interesting and well written. Considering that the results were retrospectively analyzed, the authors should use the score matched analysis in HER2 positive patients to better explore the prognostic significance of HER2 status in the Chinese population.